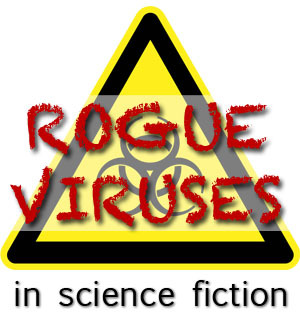 This article about writing realistic rogue viruses is part of the Science in Sci-fi, Fact in Fantasy blog series. Each week, we tackle one of the scientific or technological concepts pervasive in sci-fi (space travel, genetic engineering, artificial intelligence, etc.) with input from an expert. 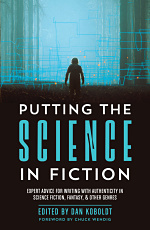 Lee A. Everett is a fantasy and science fiction writer who, in her other life, has advanced professional training within a niche intersection of biomedical research and medicine. You should follow her on Twitter. I recently watched a friend play a popular video game. His character was an assassin, and one of his missions involved stealing a virus from a lab–a relatively a common trope, right? But as the character manhandled his way into the lab, charged by the bewildered scientists, grabbed the vial, and left by a side-door straight onto a busy street, the most memorable part of the gameplay—to me—was how unfeasible it was. 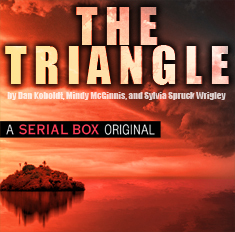 We’ve all witnessed the heist of the biologic agent in some form or another. (And when I refer to agent, I mean the bacteria, virus, protein, alien technology, or compound of interest.) It’s fun to write, and it’s fun to read, but one thing these scenarios usually have in common: seeming ignorance of the types of places these agents are kept, and the mechanisms put in place to keep people and the environment safe from the agent. When handled wrong, any reader with a small amount of experience in the area is likely to doubt the credibility of your plot for the duration of the book. I don’t think that’s the sort of notable mention most of us are going for when setting out to write a novel. Unless you’re going to pull a “many Bothans died” and sweep the getting of the agent under the rug (it doesn’t matter how we got it, we just got it!) you’re going to need to break your character in and out of lab in a believable way. So what are the top three things you should consider when brainstorming the agent for your “virus gone rogue” novel? 1. What does the agent do? How does it affect the target? Is it contagious to humans only, or to animals as well? Most importantly: how is it spread and how long can it live outside the host? An agent that can be aerosolized—spread through the air (like the flu), especially one that can survive outside of the host for a long time—is a lot more dangerous than one only spread by direct contact, sexual contact, or ingestion. The way you’d try to contain a flu-like agent would be a bit different from how you’d try to contain an ebola-like agent, and they’d have different epidemiological impacts. Get creative! There are a lot of dastardly agents out there that are quirkier than a highly pathogenic flu or a hemorrhagic disease. For example, prions aren’t even alive–they’re misfolded proteins–and yet they are one of the hardest agents to destroy, are highly contagious, and are incurable (as well as invariably fatal). 2. How is the agent created and stored? What the agent can do, and how stable it is, is going to impact how scientists create and store it. This is going to determine whether it’s kept frozen (like in frozen nitrogen canisters), enriched in some sort of media broth, contained within other living cells (e.g. a virus), etc. All that will determine mobile it is: how long your characters will be able to handle and keep it without some pretty specialized equipment. Does the agent need to be inoculated into a carrier host to keep it viable, or will a splash of it still be infective a decade later? Now here’s the part that will likely impact your plot the most: how do the characters handle the biosecurity and biocontainment of the facility they’re breaking into? These are the procedures designed to keep a “rogue virus event” from ever happening (without nefarious interference, anyway). Most facilities have primary and secondary means of containment: the ways they keep the people and the environment safe from the agent. At the potentially deadly Biosafety Level- 3 and -4 (think something risky to work with, something than can infect humans but for which we have no cure—an alien virus, for example), there is going to be a lot of security within the building. After going through the suitability assessments and background checks to get access to the building, there are lots of locked layers to get through before you reach the lab, likely involving keys or swipe cards—even biometric scanning. And of course, there will be security personnel and security cameras to thwart. Blackmailing or otherwise manipulating someone who already is cleared to enter these spaces might be the simplest way of infiltrating the lab, or perhaps technology can be used to circumvent the surveillance. But what happens once you get inside? If you’re sneaking in or trying to blend in with the staff, then step one, you’re going to head to the locker room and get naked. Yup, nothing that goes into a lab containing such a deadly agent is going to be able to come out without some serious decontamination. That includes people. So you strip (no jewelry, no underwear, no hair bands, nothing) and put on facility PPE (personal protective equipment): often long-sleeved scrubs, socks and shoes (probably crocks), hair net, special respirator that you’ve been approved to use, and two layers of gloves. To get back out of the lab once you’ve done your thing, there is a careful order of removing PPE so it can be autoclaved, decontaminated with chemicals, or destroyed. Then you shower out before you’re allowed to go back to the locker room. Chances are, if you are trying to steal an agent, you don’t really care if you expose the outside world to it—so perhaps you skip the shower. But putting on the proper PPE is going to be the best way to blend in and decrease the chances that the staff or scientists notice that you don’t belong there. Now you’re inside the lab, and your PPE is keeping you safe from the agent. What’s keeping the lab space and rest of the environment safe? 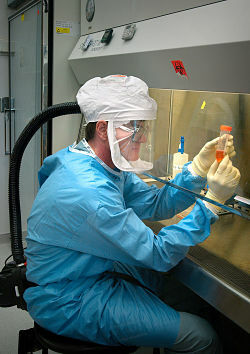 Ideally, the agent should be so contained that the lab itself remains clean. If you’re following proper procedure (ahem, *not* breaking it out of the lab) agents will always be worked with under some sort of hood or biosafety cabinet (BSC). There are many different types of BSC’s; these are special working spaces that use a wall of air to keep the agent inside the cabinet and contaminants outside, and are ventilated so that the air passing over the agent is filtered before being vented outside or recirculated. Or, at the BSL-4, the agent may be kept in a completely sealed cabinet, and can only be manipulated using thick, unwieldy gloves attached to the unit. To reach the agent, a character is going to have to bust the agent out of that containment cabinet somehow. Yet once out of that containment cabinet, the agent could easily be slipped into a pocket and walk right out of the locker room with you—if someone doesn’t catch you first. We could talk for a while about airflow back in these facilities, but suffice it to say, if the all-important airflow is ever messed up, or if there is a biological spill, all workers must immediately leave and the whole lab gets shut down until everything is back to normal. The distraction of that sort of chaos might be ideal cover for the theft. In the event of emergency (power loss, natural disaster), you’re going to have to quickly be able to leave the lab, yet do so in a manner that won’t contaminate the outside world. Usually this involves putting extra, clean PPE on top of what you’re already wearing, to trap any contaminant inside with you as you head to an emergency meeting point—which will be separate from where the rest of the building is meeting. Often, local fire departments and hospitals are kept aware of the type of work going on in the labs, and receive extra training on what to do and where to go in medical emergencies. If some sort of emergency was staged, and your character had allies among the paramedics or fire department, that might be another unobtrusive way to slip an agent out. Understandably, including all these detailed layers in your narrative could start to feel a little bulky. But I think it’s important that, as a writer, you’ve thought about these aspects—at least in terms of setting and worldbuilding–so the characters can subvert them in a believable way. 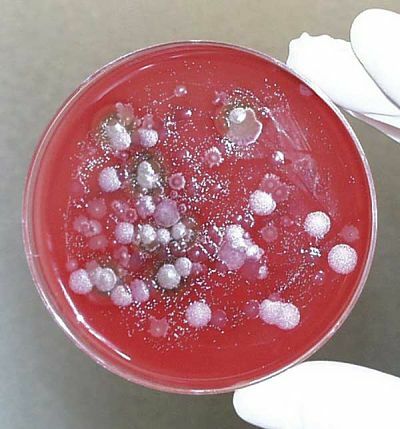 How a character handles the biosecurity measures can really impact the plot—especially when things start to go wrong… because stealing a deadly, world-altering virus shouldn’t be easy, right?